This has been the coffee at home as of late. My "beat the living crud out of a buncha twee little rich boys" sense is tingling. Right at the moment, some merlot mixed with some diet Sprite half and half. Community Coffee, New Orleans Roast. Whisky sour, with a dash of bitters, and without the egg white. Almost every Friday evening I wonder what Skip is sipping on. Yeah I remember him mentioning JD. You speak to him often, btw? Please give my regards. Coffee has become my new thing like tobacco, I like variety, there are so many variations, so I joined an online coffee club, for $15 a month they send you a different bag of coffee each month. It has been fun, it’s the little things that get me up and going in the morning ya know? Also this is the owner of the VCR roastery, he ain’t rich and he put everything into his business, I hardly see him anymore because he’s so busy, but you’d be hard pressed to beat up on him I think, he’s a very large fella. I love supporting his efforts, he’s got a passion for coffee and our local community, he supplies many of the local restaurants in town and his coffee is damn good! Fredericksburg is definitely a coffee town though, there are al least 4 local roasteries and it seems like a new coffee shop opens every other day or something. There are 8 I believe just in the downtown area alone. You’ve got the wrong end of the stick, old boy. Nothing against the producer. It’s the potential consumer. Can’t you just see Kelli/Kandi (yoga pants, down vest, baseball cap, to-go coffee cup) and Hudson/Hunter/Taylor/Skyler (Track pants, puffer vest, baseball cap, to go coffee cup) discussing how “jazzy” the blend is or making a spectrum joke? It’s a joke anyway. I’m drinking Nescafé. Cool. Coffee shops, and hookah bars, are beginning to show up around here too. Drinking Community Coffee this morning. 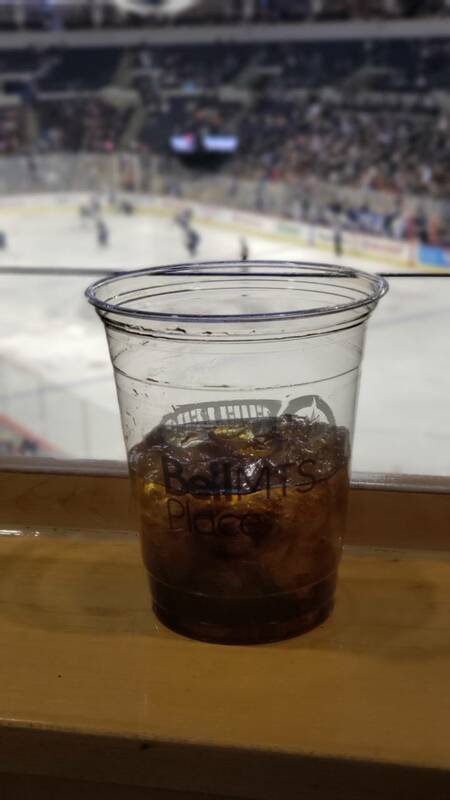 Spiced rum and coke, in a suite at the hockey game. Yeah boy. Johnny Walker accompanied by Pirate Kake in a bent unfinished Savinelli at the moment.